“There has been a plethora of television programs on food and cooking in recent months and I believe it is possible, if we take the time, to mull on some of this in a faith perspective,” says Good Samaritan Sister Annette Giltrow. At evening prayer recently I heard the reading from St Paul: “the kingdom of heaven is not food or drink”. I know I can be lacking in the historical or exegetical context, but I bristled – not an unusual experience for me with St Paul. It seems so contrary to the multiple biblical images of God providing food for his people, such as pasture, manna, the grain, the wine and the oil, the heavenly banquet of fine wine and rich food. Most of all, it is Jesus himself who gives food and wine, gives us his body and blood and says “take this all of you and eat it… drink from it… and do this in memory of me”. For our relating to God and to each other we are given food. For a long time now the inter-relationship between faith and food has been quite profound for me. When I was living on my own I found it very difficult to go to Eucharist when I hadn’t shared a meal with anyone. The first thing we do to make someone welcome or to get to know them is offer them a drink, something to eat, or we “go for coffee”. Meanwhile, at a similar but different level, we nurture our relationship with God by taking time to drink in, as it were, the awareness of the presence of the Creator God. There is always a moment of absolute delight for me when I have prepared food for others: the meal begins and there is the moment of silence, of tasting and savouring and taking in something pleasing to the palate. It can be a moment of communion. There can be an element of the sacred in this silence of appreciation and of giving thanks. There has been a plethora of television programs on food and cooking in recent months and I believe it is possible, if we take the time, to mull on some of this in a faith perspective. God is very surely in the ordinary and the mundane. Recently a radio commentator was somewhat negative in his assumption that “most people” had a repertoire of only five or six basic meals. My question is: why the only? Special occasions aside, the effort of the ordinary and everyday when nurturing either body or soul is the essential. Whoever these “most people” are, the effort to manage family or community meals is no small task; the care and concern with which this is done can contribute significantly to the feeling of belonging for those at table, to communion. This attentiveness to possible communion is beautiful and it is what I believe I take to, and bring from, Eucharist. These television programs have given us the opportunity to listen to the philosophies of various cooking gurus, and when we listen to someone like Maggie Beer we hear familiar language such as “gather at the table… prepared with love… let the little one’s learn from you”. Together with cooks such as Stephanie Alexander, Maggie encourages us to enjoy growing our own produce and take delight in the miracle of the growth of the seed to produce a rich harvest. For me, the messiness of growing food and preparing it is part of the rhythm of life and being present in the life of Creator God. My growing everything organically has also become an interest for others in our street at Glebe, the staff of St Scholastica’s College as we greet each other before or after school, and many of my friends. This is one small but real way I believe I can respond to the Statement of Directions for our Chapter of 2005 to “Cherish the whole of creation”. 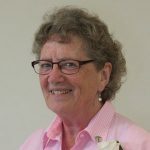 In recent years, Good Samaritan Sister Annette Giltrow has worked part-time in the Good Samaritan Archives and full-time in the garden. "I've learnt a lot about gardening from the many nationalities I've lived amongst over the many years of my religious life," she says. "I've also learnt that my ability as a cook can be a real gift to others and hence a delight to myself."